enormous amount of development in this opening, driven by young players such as Vachier-Lagrave, Wojtaszek, Giri and Dominguez-Perez. These days new ideas in the opening are conceived above all with the support of engines. And it is not rare for tomorrow's theory to start with an "Engine against Engine" contest in the computer chess engine room on playchess.com. The new Najdorf Powerbook 2015 combines both: the latest state of theory based on 93 000 master games with more than 1,726,000 high class Najdorf games from the engine room on playchess.com. There 6.Be3 has long since taken over from the move preferred by humans, 6.Bg5. 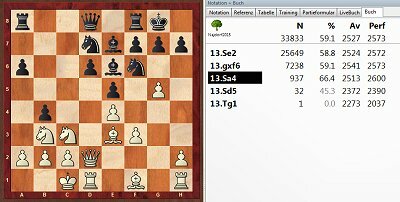 (if you do not like 6.Be3 Ng4, you can also start with 6.f3) 8...Be7 9.Qd2 Nbd7 10.0-0-0 0-0 11.g4 b5 12.g5 b4 : The actual natural move 13.Na4 was first employed in high performance chess in the game Dominguez-Perez - Vachier-Lagrave, Khanty-Mansiysk 2015. The total of merely 47 previous games in the online database are hardly any more help. The Najdorf Powerbook 2015 is here based on 937 games and considers Black to be in difficulties. Mirror - all files in one 439 MB Folder. Ive replaced links with a Mirror link for all files into one. what is the zip password ? Sorry about that, I also placed this working link in main post above.